Departed on Aug. 13, 2010 and resided in Owensboro, KY.
Gertrude Tichenor Stroud, 95, of Owensboro died Friday, August 13, 2010 at her home. Gertrude was born on January 20, 1915 in Centertown, Kentucky to the late Clarence and Ollie Ashby Tichenor. She and Eugene Stroud , Jr. married on November 23, 1935. In addition to her parents, she was preceded in death by her husband, Eugene, on December 19, 1992; two sisters, Dova Martin and Agnes Bishop; and two brothers, Carl and Ed Tichenor. 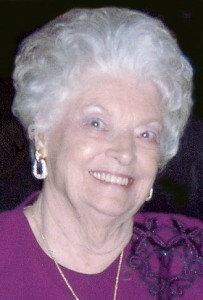 Gertrude is survived by her daughters, Betty Ellis of Stuart, FL and Patricia Breeding of Nashville, TN; sons, Joe (Mackie) Stroud, Donnie (Martha) Stroud and Jerry (Brenda) Stroud all of Owensboro; thirteen grandchildren, John Ford, Brad Ford, Bridget Mattingly, James Ellis IV, Tammy Lewis, Aprilea Stroud, Glenn Stroud, Neal Breeding, Karen Keller, Clint Breeding, Christy Dickerson, Ronnie Stroud and Allison Brant; sixteen great-grandchildren; several loving nieces and nephews; as well as her Third Baptist Church Family of which she was a member for over 60 years. Services were held at 11:00a.m. on Monday, August 16, 2010 at the Chapel of James H. Davis Funeral Home and Crematory. Burial followed at Rosehill Cemetery. Expressions of sympathy may be made to Hospice of Western Kentucky, 3419 Wathens Crossing, Owensboro, KY 42301 or Third Baptist Church Building Fund, PO Box 808, Owensboro, KY 42302-0808.